Come to the Hong Kong WTO Protests Report Back and watch exclusive video footage of the protests and actions. 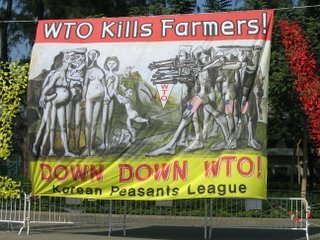 Hear from the Bay Area WT-NO Delegation, a the delegation of displaced garment workers, youth, activists, and organizers and members of the Korean Exposure and Education Program (KEEP) that went to stand in solidarity with the worldwide opposition to neoliberalism and corporate globalization. The Bay Area Day of Remembrance Consortium will present DAY OF REMEMBRANCE 2006: Carrying the Light for Justice! - The 25th Anniversary of the Commission Hearings at San Francisco Japantown's AMC Kabuki Theatre - 1881 Post Street (at Fillmore) on Sunday, February 26, 2006 at 2 p.m. This year's commemoration of the World War II incarceration of over 120,000 persons of Japanese ancestry in U.S. concentration camps will feature cultural performances, film, and a candle lighting ceremony with U.S. Senator Daniel K. Inouye (invited) as keynote speaker; and Dr. Satsuki Ina, psychologist and filmmaker (Children of the Camps and From a Silk Cocoon) as guest speaker. San Francisco Public Defender Jeff Adachi will serve as the M.C. Cultural tributes will include Melody Takata of Gen Taiko Arts; the Japanese Bilingual Bicultural Program West Children's Choir with guest artist Francis Wong; and shigin (commemorative poetry) by Susumu Saiki. Featured films will highlight the power of grassroots voices and personal stories, with an excerpt from Donald Young/KVIE's From Resettlement to Redress; and the film short: The Assembly on Wartime Relocation & Internment of Civilian, a public testimonial event that took place in April 2005. A procession will follow from the Kabuki Theatre to the Japanese Cultural and Community Center of Northern California, where an interfaith candle lighting will be led by the Japanese American Religious Federation. Tickets are $20 Door, $15 Advance; Group rates available for 10 or more. Call (415) 921-5007 to order tickets or to help with event. Another Tremendous Loss - Chris Iijima - "Don't forget to live before you die"
In his 20s, he sang "Free the Land" from concert stages. In his 50s, he wrote law review articles that protested the theft of Hawaiian ancestral lands. In between, Chris Kando Iijima married, raised two sons and worked as a teacher, lawyer, bartender, community organizer and law professor. By the time he died on December 31, after a long illness, Iijima had fulfilled a promise he had made to himself in a song he had recorded in 1973: Don't forget to live before you die. Chris's youth was shaped by an event before his birth, the unjust imprisonment of his family and other Japanese Americans during World War II. Chris's father, Tak Iijima, fought in the famous 442nd Regimental Combat Team, the all-Nisei unit that took exceedingly heavy casualties in Europe to prove their loyalty to America. When he entered Columbia University in 1965 on what could have been a ticket to professional respectability, Chris was already skeptical about America's unfulfilled promises to its minorities. His mother Kazu, whose 1986 interview in Amerasia Journal was entitled "Always A Rebel," had been a lifelong progressive activist. He shared her view that fundamental changes were needed in American society before workers and minorities could find justice. Columbia in the late 1960s was also the scene of strong anti-Vietnam War protests and some of the most powerful East Coast stirrings of the nascent Asian American movement. Chris found his voice as a pamphleteer, organizer, speaker and visionary for both movements, while also developing his gifts as a poet, songwriter, guitar player and singer. With a love of music that came from a dad who was a classically trained musician and church choirmaster, Chris wrote songs that, even today, are good enough for Broadway or the Top 40. 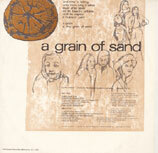 Listen to the toe-tapping "Dust Don't Fly Away" on his 1982 Back-to-Back album or "Free the Land" on the landmark 1973 Grain of Sand album (http://www.bindurecords.com/music/grainofsand). His husky voice, charismatic stage presence, and funky picking skills virtually jump out of the speakers. 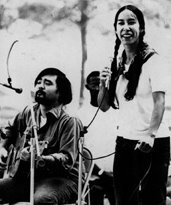 Chris, Joann Nobuko Miyamoto and "Charlie" Chin toured the country and campuses in the early 1970s, singing songs and expressing an Asian American identity that was, to use Chris's own words, "originally meant to be a means to an end rather than an end in itself. It was as much a mechanism to identify with one another as [it was] to identify with the struggles of others, whether African Americans or Asians overseas. It was less a marker of what one was and more a marker of what one believed." 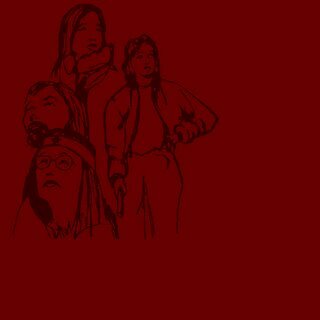 In 1973, the trio entered a recording studio and cut "A Grain of Sand: Music for the Struggle by Asians in America." This album, which is recognized as a staple of American folk culture and sold in the gift shop of the Smithsonian Institution, was more than just grooves on a piece of vinyl. From Boston to Chicago, to San Francisco to Honolulu, Asian-derived people who had been classified in the Census as "Other" suddenly realized that they had an identity, a history and a place at the table. After working as a teacher for several years, Chris enrolled in law school. He rose rapidly, becoming a judicial clerk, a lawyer and then a law professor. At the time of his death, he was not only a law professor at the University of Hawaii, but also head of its pre-admission program. One of the most compelling songs co-written by Chris on the Grain of Sand album is the "Foolish Old Man Who Removed Mountains." It is based on a Chinese fable about a man who decides to move the two mountains that block the sunlight from reaching his house. Each day, he carries buckets of dirt, while his neighbors laugh, saying there is no way that one small man can remove such huge mountains. He replies, "When I die, my children will dig after me. And when they die, their children will carry on. With every shovel full, the mountains become lower. Why can't we remove them?" Like that old man, Chris spent his life removing the "mountains" of racism, sexism and greed. While he did not live to see his task completed, his example inspires the rest of us to carry on. Celebrations of Chris's life are being planned for Hawai'i, Los Angeles and New York, and photos, video, audio and memorabilia about his life are being collected. To participate, or to make a memorial donation in his name, please contact mailto:karenishizuka@hotmail.com. Phil Tajitsu Nash is CEO of CampaignAdvantage.com and co-author of "Winning Campaigns Online." For full summary go to the educational justice yahoo group site. ...The first order of business was the election of officers. Eric Mar nominated Norman Yee for president and Mark Sanchez nominated Eric Mar for president. Eric declined the nomination. ... By acclamation of the Board, Norman Yee was elected. Norman then nominated Sarah Lipson for vice president. The votewas 5-2 (nays-Wynns and Kelly). Outgoing President Eric Mar congratulated new President Norman Yee and Vice-President Sarah Lipson and yielded the gravel. Public comment was then taken. President Yee said, "Thank you for showing confidence in my leadership. It is not be very easy in 2006 with budget issues, school closures and thesearch for the new superintendent. Alot of issues will be need to be dealtwith. I am so glad that we have a good board with passionate people who believe in our district's children." The next item was the Open Government Policy, authored by Mark Sanchez and co-authored by Norman Yee and Sarah Lipson. Several of the key componentsof the open government policy is that you will no longer have to call in toget on the speakers' list-but rather sign a speakers' card on the night ofthe meeting (similar to speaking at the Board of Supervisors). The disrict will be required to disclose all records exchanged between parties duringnegotiations of sole sources and leases. The Superintendent and the President would also have to make their schedules available to the public for all school district-related meetings.Most of the discussion centered around the issues of recording closed meetings. The legislation called for tape recording all of the closedsessions and make them available only in the context of a specific courtorder issued by a judge as part of ongoing litigation. Commissioner Wynnsobjected to the $42,000 cost and President Yee felt that this might be a redflag to anyone who is in litigation with the district. The Board agreed to put a proviso for the District to look at the issues arising from the costsand concerns about litigation and make recommendations. Sunshine Commissioner Rick Knee and I bought up the issue that the legislation allows the District to have 30 school days to appeal. Those participating in public comment used the time to talk about school closures. Amos Brown, president of the NAACP, reminded the Board that alarger number of African American students are being impacted by theproposed closures. Dr. Brown recounted that in 1978, the African Americancommunity boycotted the district by homeschooling their students. He statedthat his recolleciton was not a threat-but he was disappointed that therewas not an African American member on the School Board as well as the focuson schools with high percentage of African American scholars on theDistrict's closure list. The District then adopted the School Assistance and Intervention Team (SAIT) Findings and Recommendations for recommended actions for Dr. William CobbElementary School. In Sept. 2005, the CA Board of Education identified Dr.William Cobb for not meeting its identified targets under the ImmediateIntervention/Underperforming Schools Program. Dr. Cobb will have two years to show progress with the addition of a District/School Liason Team, Contract with a state-approved SAIT providers, complete the academic programsurvey with nine essential program components, and implement the correctiveaction plan and meet identified academic growth targets. The District then presented the instructional calendar for 2006-07.Commissioner Sanchez brought up the point that the Chinese New Year was noton the calendar. Tom Ruiz, director of Labor Negotiations pointed out thatthis year, the Lunar New Year will begin on the Sunday prior to President'sDay. The Board then discussed if they wanted to recommend a special daythat week to designate the Chinese New Year. Dan Kelly also brought up the concern about that since Jan. 1, 2006 falls on a Monday, school begins on aTuesday (Jan. 2) to begin the spring semester. Student Representative JasonWong suggested that the Board moved the winter break to start one week lateron Monday, Dec. 25 and end on Jan. 4. But Tom Ruiz pointed out that theDistrict would need to negotiate with the unions to see if this would beacceptable. So the BOE decided to postpone the vote on the recommendedinstructional calendar for 2006-07 to a later meeting. The action item to adopt the Proposition H Committee's recommendations forFY 2006-07 was sent to the Budget Committee. It is also an infomational item on today's Curriculum Meeting. The action item to adopt the recommended policy on Sexual Harassment was moved to the Curriculum Committee. Kimshree Maufas talked about the Commission of the Status of Women's request to review the policy in order toprovide comments to the Board. The item to adopt the Superintendent's recommendation to deny the EdisonCharter Academy's petition for renewal passed when at the request of Edision Charter Academy, Wynns moved to suspend the rules so that the final votecould be cast that night. The Board voted 7-0 to deny Edison CharterAcademy's petition for renewal. This is a required step in order for EdisonCharter Academy to again get its charter passed and renewed by the staterather than the district. ....At 12:05 a.m., President Yee closed the first board meeting of his presidency. Farewell Sox - Thank you for inspiring our generation to fight for redress/reparations and for community empowerment and social justice. We'll never forget your smile, warmth and 'serve the people' spirit. Tsuyako "Sox" Kitashima Passed away on Thursday morning December 29, 2005 at the age of 87. 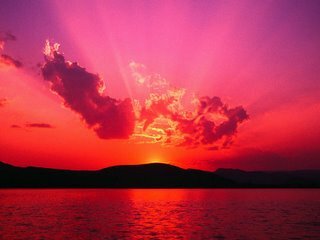 Preceded in death by her husband Tom. Loving sister to the late Nobuko, Lillian, Masao, and Hisao. Sox is survived by her son Alan (Sylvia), grandson Aaron, and her brother James (Boe). Aunt to many nieces and nephews. She was totally devoted to the San Francisco Japantown community. A community leader on many issues. She became synonymous with the redress and reparations campaign for Japanese Americans wrongfully incarcerated during World War II. She loved volunteering her time to Kimochi Inc., a community based organization which provides services for the Japanese American elderly. Sox spent so many mornings working in the kitchen helping prepare lunches for the elderly. Sox will be missed by all she touched. She was "one of a kind." She lived a full and wonderful life. A Memorial Service will be held on Sunday, January 8, 2006 at 4:30 P.M. at the JCCCNC (Japanese Cultural and Community Center of Northern California), 1840 Sutter St., San Francisco. Published in the San Francisco Chronicle from 1/1/2006 - 1/5/2006. Published by AACP2003, 174 pages, paperback. "Birth of an Activist: The Sox Kitashima Story" by Tsuyako "Sox" Kitashima and Joy K. Morimoto is the autobiography of a California-born, Japanese American woman who was one of the leaders of the redress and reparations campaign for Japanese Americans wrongfully imprisoned during World War II. This book tells the very human story of "Sox" Kitashima, whose life was caught up in extraordinary national and international events and how she became an activist as a result. The beginning of the book offers a fascinating glimpse into what life was like in the 1930s in what is now Fremont, California. Far from being part of the high-tech urban center it is today the area was rural and agricultural where the main forms of entertainment were the radio, baseball and other sports, movies in Oakland or San Jose, or local dances. "Sox" received her lifetime nickname at this time because few of her non-Japanese American teachers and peers could pronounce her given name of Tsuyako. Interestingly enough, the schools in this farming community were completely integrated with Asians, whites, and blacks sharing the same classrooms. The center part of this book is the experience of internment during World War II and the aftermath. One of the problems of memorializing the internment is that so many of those adults who experienced it have already passed away leaving the experience to be described by those who were children at the time. Sox is one of the surviving young adults of the time who had a clear eyed understanding of what was happening without the warm glow of childhood to soften the experience. She remembers the humiliation, the suffering, and the suicides that the Japanese American community experienced as the result of losing their property, homes, jobs, and identities when they became government issued numbers in the camps. Above all they had the shock of being treated in such a fashion by what they had been taught was the best and most enlightened democracy in the world. 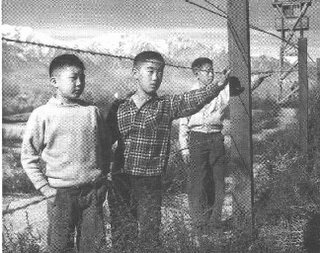 One area that is rarely explored in history is the post-camp experience of Japanese Americans. Apparently it wasn't easy for many of these displaced persons to return to a normal life after the war. The US government gave each released internee $25 to begin their lives again as they left the camps. As a result of this further injustice, many of the former internees were initially forced to live in charity shelters and churches in overcrowded conditions that were in many cases worse than they had lived in during the war years. They also had to face the continuing hostility of many communities who failed to distinguish between Japanese and Japanese Americans. Sox joined the redress movement in 1980 inspired by the passion and convictions of the Sansei or third generation of Japanese Americans. These young activists along with some members of the Nisei or second generation of Japanese Americans waged a long lobbying campaign in the United State Congress for an official apology and monetary compensation towards the internees. Sox came to know many politicians in Washington DC personally in her quest to enlist them in the redress cause. For much of this time most people, even those within the Japanese American community remained firmly convinced that nothing would ever come from the effort and that the US Government would never apologize for its actions. Even the activists were surprised when their oftentimes amateur lobbying efforts culminated in the successful passage of the Civil Liberties Act of 1988. Former surviving internees were to be paid $20,000 each and receive a formal written apology from the United States Government. In many cases, the apology was more valued than what was by then a very token compensation in relation to the property already lost and the humiliation already experienced. Moreover, many internees were no longer eligible since they'd already died before the law came into existence. This group of people included Sox's mother and two brothers. 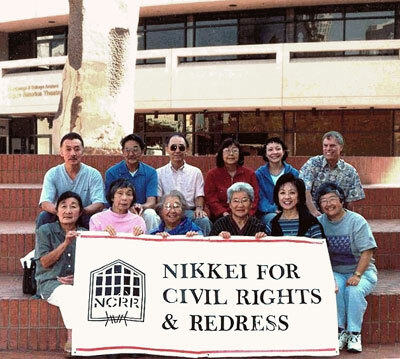 Sox volunteered with the government's Office of Redress Administration to educate the Japanese American community about their rights and their eligibility to apply for redress soon after the passage of this law. She tells of her many different triumphs and tragedies in finding these people, in some cases living very neglected and lonely lives in forgotten apartments, veteran's homes, and even prisons. She also describes her continuing battles with Congress and the rest of the US Government to insure adequate funding for redress and the battles to include those determined as ineligible in the 1988 law. Among the excluded were children born to mothers temporarily on leave from the internment camps who were visiting their husbands serving in the US military, and were subsequently returned to the camps. Also, there were citizens of Japanese descent living in Latin America, who were arrested by the FBI, and interned as exchangeable hostages in the United States. Officially these internees were held as "illegal immigrants" to the US despite the fact that it was the US Government that had brought them here. Above all, this book emphasizes the fact that people need to be educated about what this period of internment means to our history as Americans. It also emphasizes the fact that people must stand up for their rights. Sox's story shows that even short, feisty grandmothers can carry out this fight for rights and the task of educating people about them.